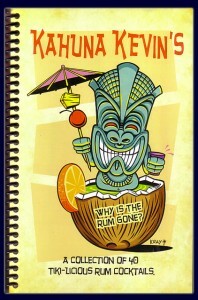 Of course, that was before I learned of Kahuna Kevin’s “Why Is the Rum Gone? A collection of 40 tiki-licious rum cocktails.” That’s right – no less than 40 ORIGINAL rum drinks ranging from the sweet to the savory, and with such pirate-appropriate names as the Addled Wench, Blackbeard’s Depth Charge, Headhunter’s Punch, and yes, even the Scurvy Mouthbanger. Ok, fancy names aside, how are the drinks? Before I answer that, let me tell you a little about the sort of obnoxiously spoiled drinker I am. When it comes to mixed drinks, I lead a remarkably charmed life – most bartenders I frequent have won international mixology competitions. They often make their own bitters, grow their own herbs, and some even carry degrees in the culinary arts. In short, rum&cokes don’t impress me, and if you top off my Manhattan with one of those crap dayglo-red maraschino cherries you get at Pick’n’Save, you may as well have strained the drink through an old tubesock. So yeah, THAT’S the standard against which Kahuna Kevin is being measured, which is why I was so astounded at the shear artistry found within these pages. Angostura bitters, orange bitters, nutmeg, maple syrup, allspice, clove, bacon, vanilla… the ingredients list strays far and wide, making for a whole range of wonderfully unique drinks with remarkably complex flavors. But beware, this sort of inspiration does come at a cost – not only will you need dozens of rums (each drink is very specific in identifying which brand will best suit) and hundreds of ingredients if you hope to sample all 40 cocktails, but even individual drinks average 12 or so components. Indeed, the Headless Zombie boasts a whopping 17 ingredients, while the relatively modest Caramel Rebellion still chimes in at six. What I’m saying is, these drinks require some dedication and craftsmanship to bring to fruition, but if you’re up to the task you’re sure to be richly rewarded. I’ve often been a vocal proponent of drinking rum as God intended – straight up, and perhaps directly from the bottle. But, much like when the devil invented rock music, Kahuna Kevin has shown us that even God might have missed a few gems along the way. For drinks like these, mixing up some top shelf rum isn’t only forgivable, but art. 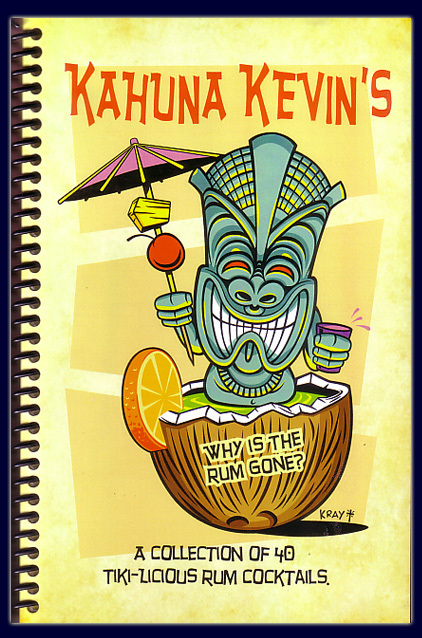 This entry was posted in Books and tagged bilgemunky's favorites, kahuna kevin, mixology, rum cocktails by Bilgemunky. Bookmark the permalink.